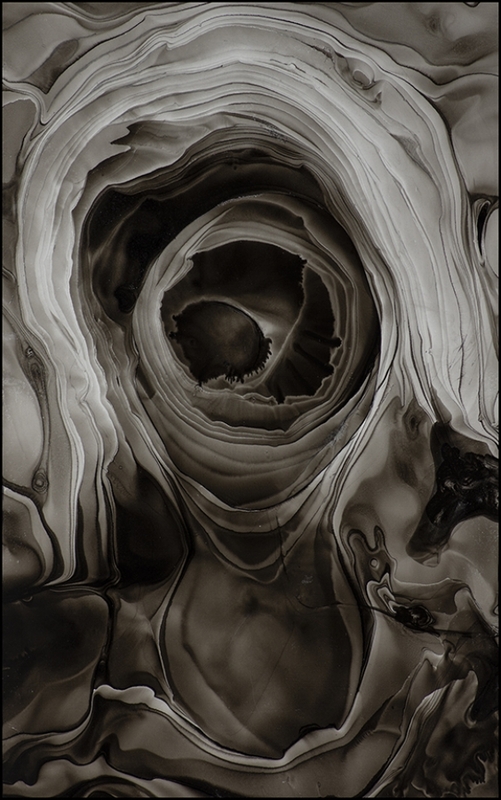 "Sumi ink layers upon itself in ghostly forms that float amongst each other. 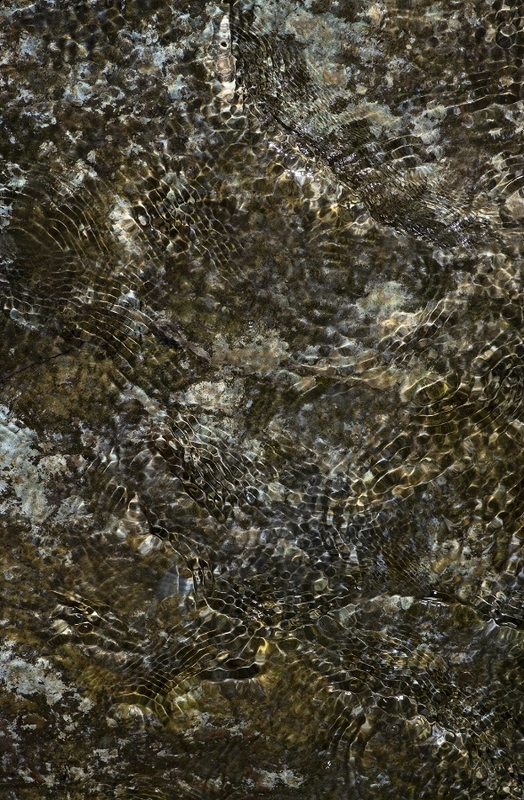 Fluid dimensions of texture appear almost collaged as lines, clearly defined to the visual eye and separate from one another, simultaneously appear to melt and drip in watery amalgamations of form. It’s indescribable: the black shadows of concentrated ink that cast over a milky, ethereal backdrop of whitish gray that is itself active with movement. The scene is smoky, as if diving into the depths of a mental space that is hidden away, somewhat hesitant to be seen. The scene is neither abstract nor figurative but somewhere in-between. A human figure’s eye appears near the middle of the piece, looking upward, and the shapes around him birth the vague outline of his head. The rest of the image, which is entitled Insight, could potentially be described as chaos. Displaying a collection of primarily ink paintings at Mockingbird Paperie this month, Llosa explores concepts of human unity and division, and the impending sense of alienation (“a fraudulent sense of separate and unique experience,” as he describes it) evident in the human condition. Faceless forms look back from their glass-enclosed frames, their figures expressively shaped as if vaguely appearing through the bends of rippling lake water, soon to disseminate at the first sign of disruption. At times certain features are visible: in Seeing Through the Deception of Separation, a figure’s mouth, lips open to reveal two front teeth in surprisingly solid detail, stands out in an otherwise amorphous scene. In Emergence into Life (the Cloud of Unknowing), a figure’s side portrait is displayed, lips shut with nose extending out and eyes presumably squeezed shut in an act of thinking (about what exactly, the viewer is unaware). In most cases, however, each figure’s form is as vague as can be, reduced at times to the mere circle of a head, to the outline of shoulders. The rest of each scene, and the inner happenings of the bodies themselves, are filled in with oceanic shapes of the water and ink. Following his belief that “we are all equal manifestations of the same torrent of vital energy” rather than separate entities barred from one another through our insistence of individual novelty, Llosa’s artwork emits this sense of unified verve. Collected together, his figures are neither one thing nor another, but together a shared experience in which each is equivalent to one another. Along with the ink paintings, and a scattering of oil paintings displayed as well, the show also includes various hand-bound journals created by the artist himself. Continuing his play with figures, some of the journals are embossed, while others create forms via found objects, such as stones from Cayuga Lake placed together to produce forms entangled in embrace or the scene of a parent holding hands with an exuberant child. An evident overachiever of sorts, Llosa’s work is also currently displayed other places beyond Mockingbird Paperie. Home Green Home, also downtown, hosts a series of Llosa’s photographs taken in the local area. Playing with the same abstracted sense of movement as his other work, with focus on water’s fluidity and the placement of parts, the photos impressively bring an ethereal and dreamlike lens to captured scenes of the real world. Red Roots is a favorite of the images, a large-scale photograph focused on clusters of red roots surrounded by green. It’s unclear whether these roots are simply abstracted or, more likely, submerged underwater. Regardless, they stick out, earthy and vibrant, gloriously beautiful. If you happen to be in Trumansburg, where Llosa is based, he also has a small show of work on display at Gimme Coffee as well. Featuring work created in collaboration with lapidary artist Mark Oros, Llosa presents mixed media assemblages that include bits of semi-precious stone. With three shows in one month, Fernando Llosa is taking on the local area in stride."